A few weeks ago I visited the greenhouse at the Montreal Botanical Garden which is part of Espace pour la vie, literally Space for Life. Espace pour la vie is made up of a collection of different exhibitions of ‘Life’. Besides the Botanical garden which has 10 greenhouses and over 30 thematic gardens, there is also a Biodome, an Insectarium and a Planetarium. I started my adventure in the gardens but when I realised I could not conquer the whole garden in the few hours I had left (it is huge), I took a detour to visit the greenhouses. The greenhouses did not disappoint. There were so many topical plants some new and some old favourites (will share about that in another post). Among the plants was a genus that I had not really paid attention to before and frankly, I don’t know why. 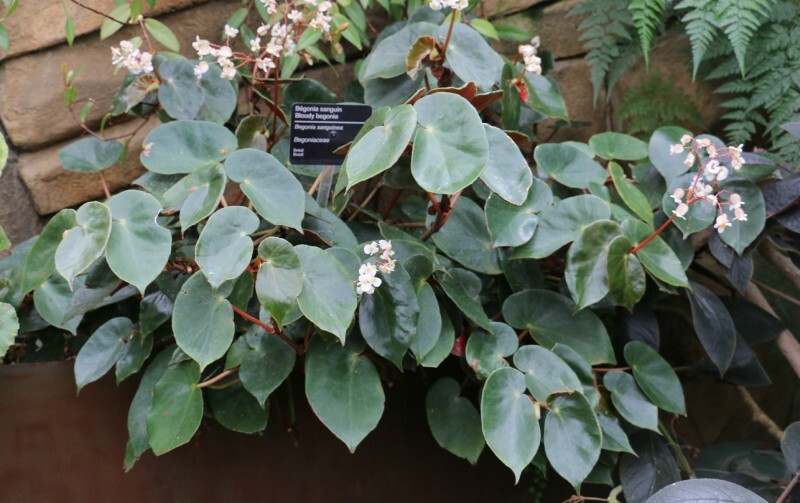 There are so many varieties of them; tuberous, fibrous and rhizomatous begonias. Some shrub-like, hanging, climbing, others trailing. I’m talking about Begonias. There are 1500 different species and over 15,000 hybrids. 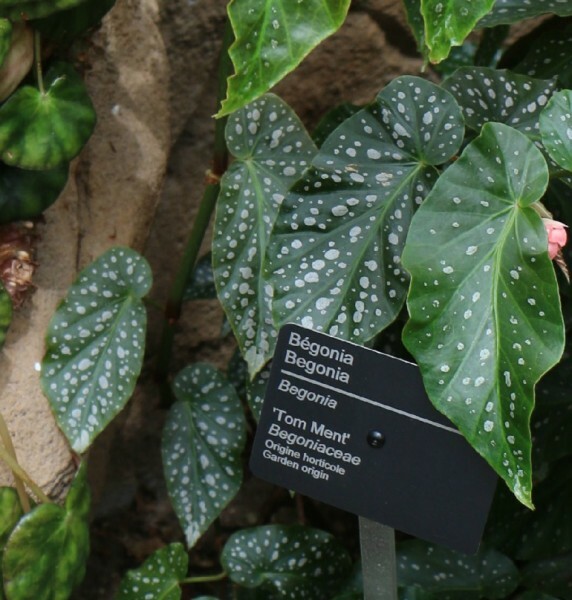 Most begonias prefer shady positions making them great as indoor plants. Join me as a I take a second look at Begonias. Begonia Moysesii aka Crinkled-leaf begonia owing to its wrinkled appearance. This Brazillian native has deeply veined pad-like leaves and red-tinged undersides. It grows in clumps with showy white flowers in the summer. 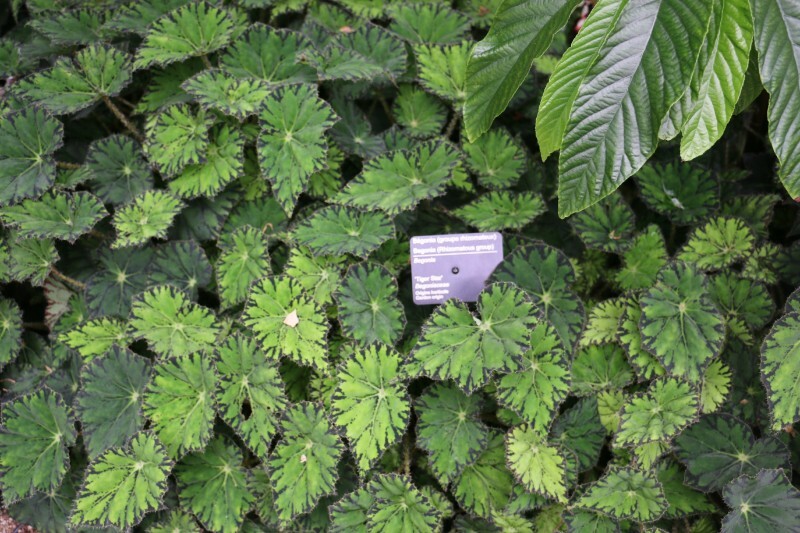 It is a rhizomous begonia. 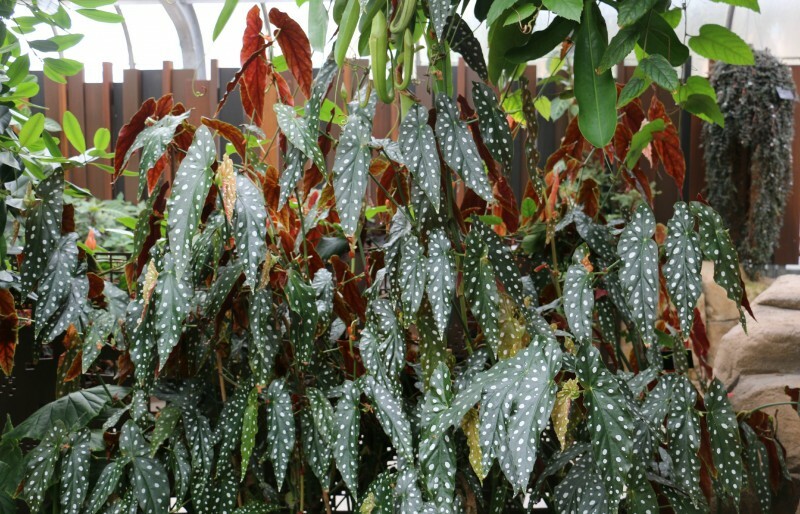 Begonia maculata var ‘wightii’ aka Polka dot begonia is of the cane-like type. The spots look like they are painted on up-close and make the leaves stand out. 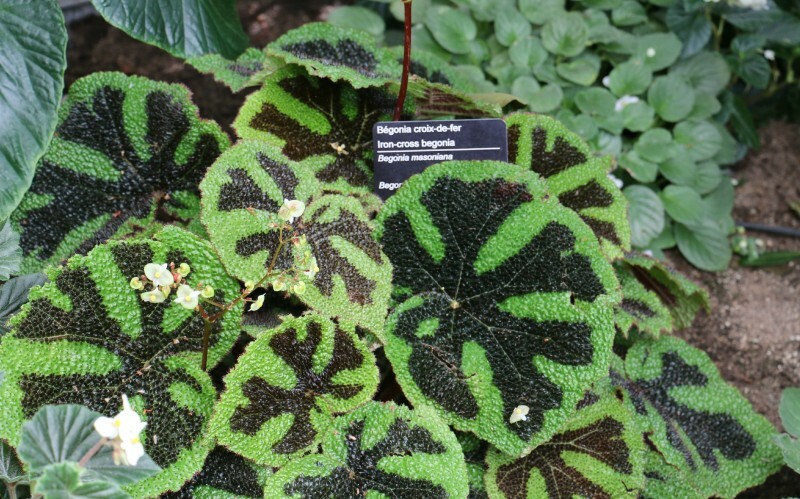 Begonia masoniana is also called iron-crossed begonia because of the pattern in the center of the leaf that looks the iron cross that were on shields and flags during the medieval Crusades. These species originate from Southeast Asia. From left to right: Is the blooming plant on the left a begonia? Middle plant, B. mazae, and B. listada on right. 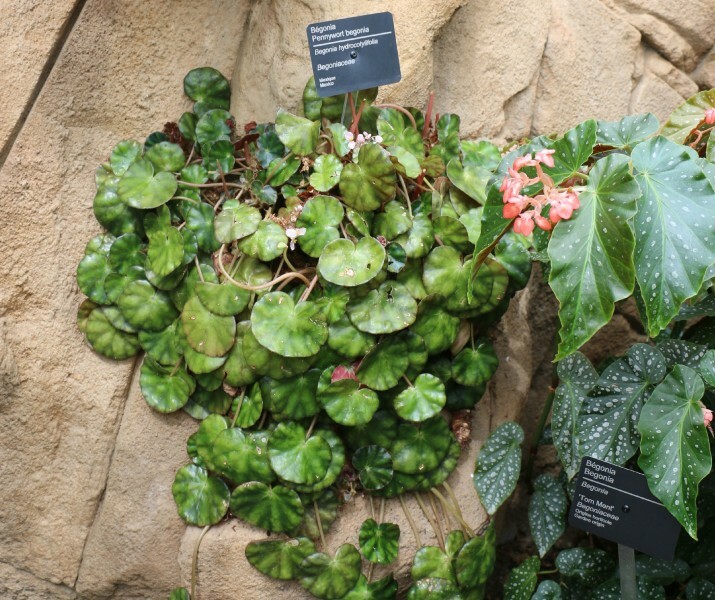 Begonia brevirimosa is a native of New Guinea with a shrub-like habit. Begonia soli-mutata aka Sun Tan Begonia. This common name was given to it because the leaves apparently change colour depending on how much sun they recieve. Begonia sanguinea aka Bloody begonia or Blood red begonia. I can’t figure out why its a likened to ‘sanguine’ or ‘blood’ though. Could it be the red stems that look like arteries carrying blood? Begonia ‘Green Jewel’. I find this one very attractive and would love to grow it. 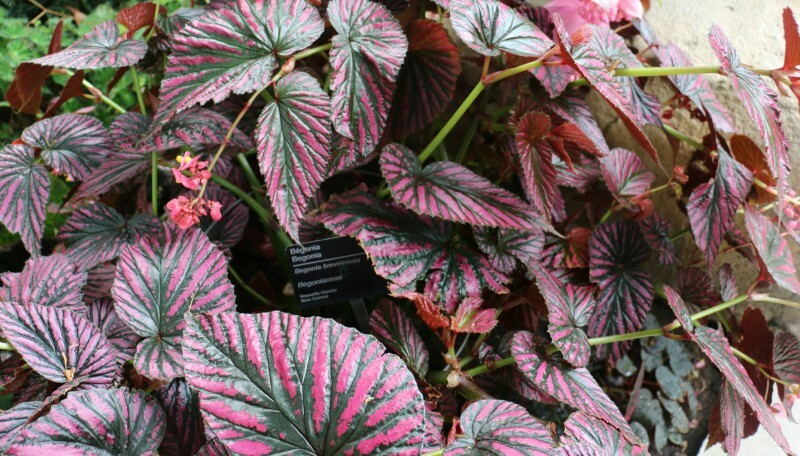 This one here is Begonia ‘Tiger star’. Begonia hydrocotylifolia aka Pennywort begonia. I find this the most interesting of all. Their thick succulent marbled leaves caught my attention immediately. 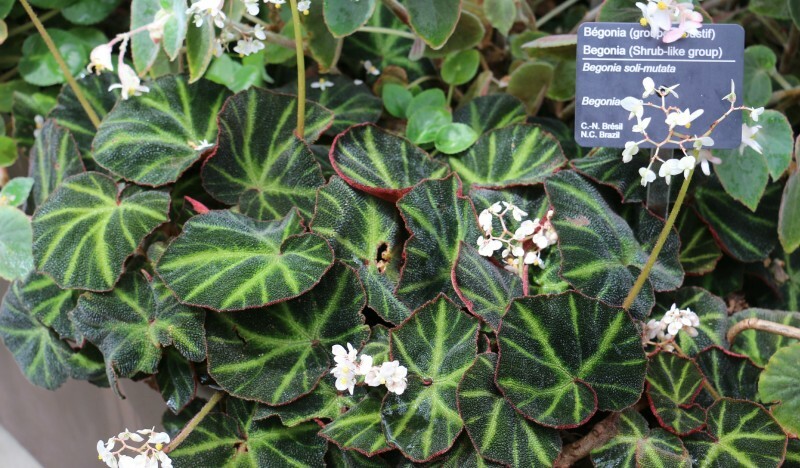 Another spotted begonia which looks similar to the cane-like Begonia maculata var ‘wightii’ shown earlier. You can tell the difference between them though in their leaf shape. This fibrous hybrid Begonia ‘Tom Ment’ does not appear as slender as B. maculata and lacks the red undersides. There were so many other species of Begonias in there I missed, but just these few I captured have piqued my interest. I don’t know much about Begonias so I’m going to challenge myself to learn about them, and to see if I can grow one indoors. Wish me luck. I haven’t picked out one yet so any tips on the easiest type to start with are welcome. They seem to grow quite big and so I may need to start with ones with smaller leaves. It has been 2 1/2 years since your blog on Begonias was written. I’m wondering what Begonia species or cultivar you decided to grow in your home? I grew a few but the dryness in my home pretty much was a death sentence. I no longer have any right now. Thank you, Barbara, for your reply regarding my request about which begonia varieties you tried growing indoors. I understand your challenge with low home humidity, especially during winter when your home heater is running. I have had good success growing begonias indoors under a fluorescent light apparatus by placing the pots on top of marble chips I keep moist, to increase the humidity. The light fixture naturally holds in the added humidity, and if you have several plants growing together, that, too, adds humidity. 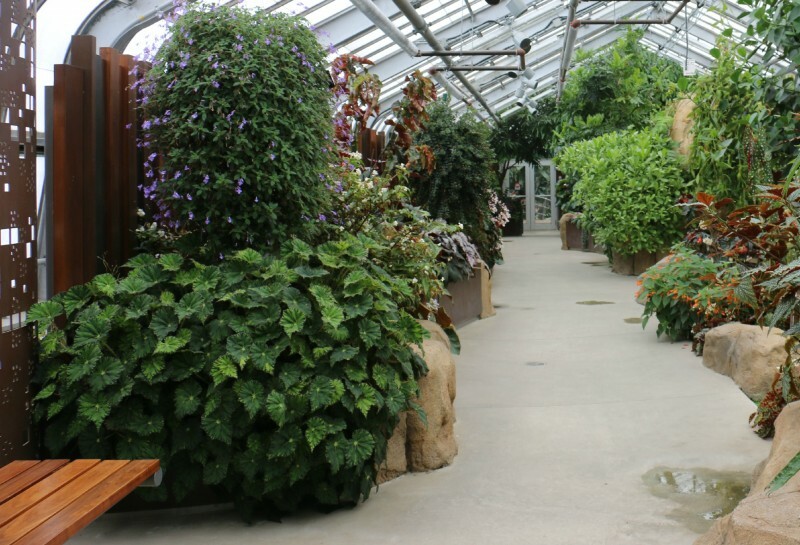 Begonias thrive under fluorescent lights, the only challenge being that they can grow too tall and into the lights! 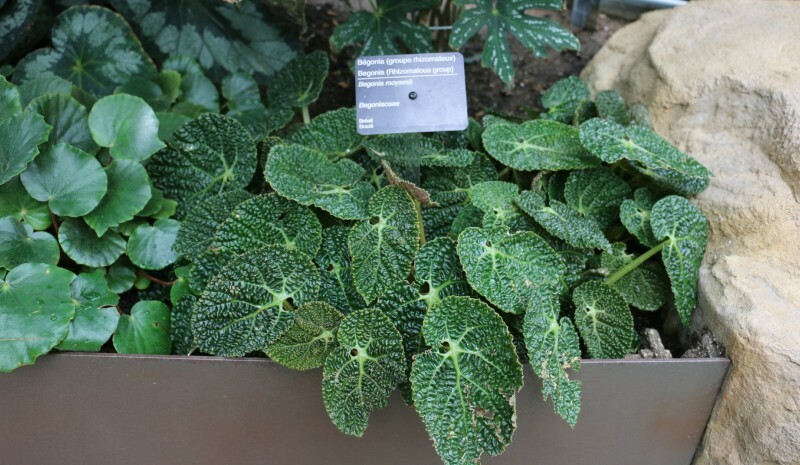 However, a subset of begonia varieties require increased humidity for indoor growth, and therefore must be grown in terrariums; under the lower humidity found in homes, they curl up and die. Terrarium growing can be fun, too, but not everyone is thrilled with growing plants in containers. Thanks for the tips. I kept a B. Solo-mutate underneath a cliche and it did great. But then I had to take it out because it got bigger and could no longer stay under the cliche and that’s when it went downhill. I also kept escargot, iron cross and ‘looking glass’ and they did well in the summer (I had them on an automatic watering system which seemed to help). But again come winter and they just didn’t survive. Thank you. I’m yet to get one of my own. I really like the escargot one with its swirly leaves. There are so many to choose from, they all have their individual beauty. I like the escargot too and its name is well deserved because it really does look like the shell of a snail doesn’t it? 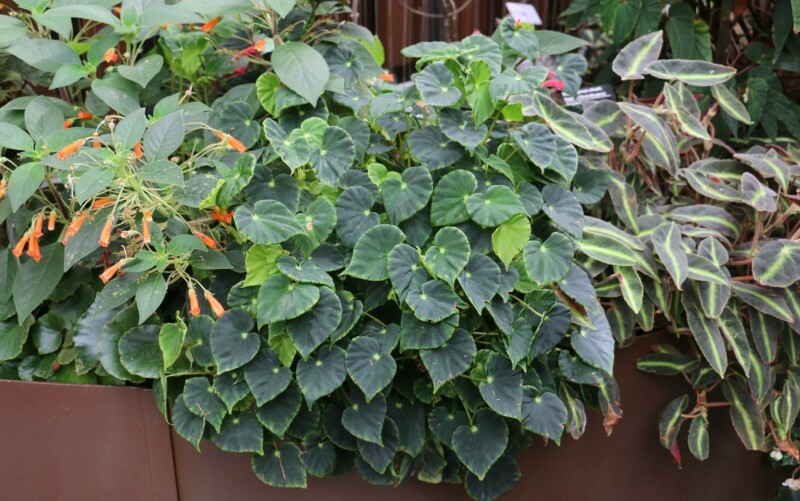 Begonias are very attractive foliage plants but they do better with high humidity. I have 3 varieties of Rex begonia (or is it Begonia rex?) – they live in my bathroom where it goes up to 90% humidity right after I shower and stays around 50% for the rest of the day. They tend to lose leaves during the winter but grow new ones quickly as spring starts. The three I have aren’t very big – 5″, and 3″ pots. I bought mine at Home Depot. You have a beautiful collection. I have a small greenhouse besides the one for my ferns I could possibly house 2 small ones in there. 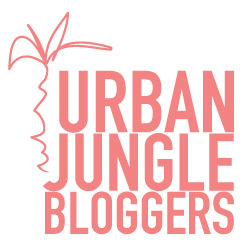 What do you use to measure humidity and light levels? Begonias are some of my favorite plants! 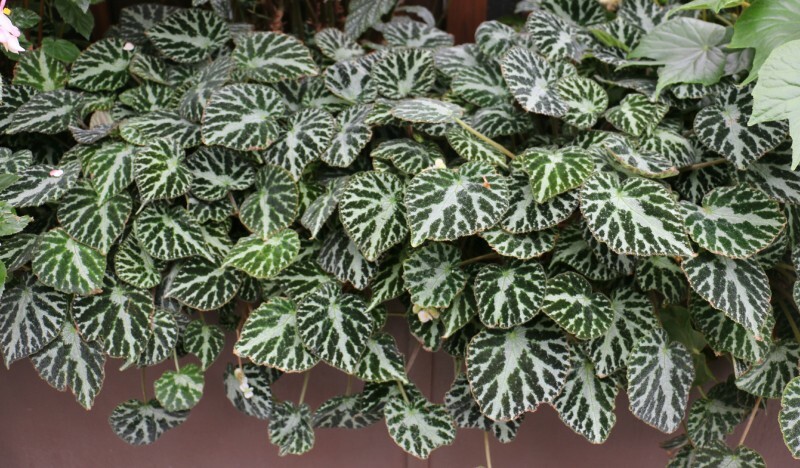 You’ve featured some splendid examples of the variety of beautiful foliage that begonias offer. The garden itself sounds marvelous! The Garden is beautiful but I’ve never toured the whole thing. That is the next thing on my list to complete. It may just mean dedicating a whole day to it. Unfortunately, I usually go with friends who may not see spending a whole day in the garden as a fun thing to do like I do :).